Stage One: To conduct market research and develop a promotional initiative for the company that could be used on all company branding and advertising material. The initiative should feature both plumbing and electric activities and present the company as a professional organisation that puts something back into the community. Stage Two: To build a website based on the market research and proposed initiative that helps to position the company’s brand in the minds of the target audience, to build awareness and create goodwill. The site is aimed at the parents of pre-school children and offers a range of learning resources that can be downloaded free of charge from the site. The resources follow guidelines presented by English educational establishment regarding exercises for numeracy, literacy and comprehension. 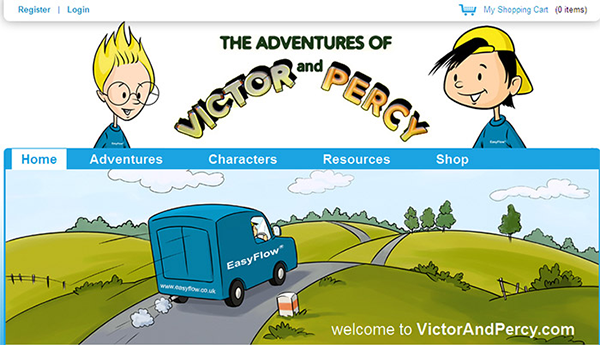 Each of the downloadable activity sheets features a character created by Peppersack; Victor Voltage, Percy Pipe or Rene Renewable, which are then divided into one of twelve types of exercise. The key to this project is the content management system that allows for easy upload of all new learning resources. Once the resource files have been created, it is a quick and easy step to add them to the site. The system tracks downloads as well as offering general site management features. There are about 200 activity sheets available for download from the site. All of these were originated, illustrated and produced in full colour by Peppersack. Over 10,000 activity sheets have been downloaded. "This was an excellent piece of marketing, the project was well received and used to promote first the company and then the brand EasyFlow. The project was entered into Barclays Bank’s One Small Step initiative and was the runner-up out of over 2000 entries. We continue to use the services of Peppersack"